One of the ways I have been preparing for the upcoming 40-miler is by completing back-to-back hard runs. I accomplished this task this weekend, having run the Monarchs in Motion 5k yesterday and the Inside-out half today. I knew I was in for a world of hurt, and had prepared myself, as much as I could, for not only enduring, but also embracing the pain. I will note that I had not planned on running either race. I told myself that if I finished in the top 3 in the 5k, I would run the half. As I did, I did. If I hadn’t run the races, I would have nonetheless run 2 hard days back-to-back. These races afforded me the opportunity, and also included the added stress of competition. I awoke at 3:58 am, 2 minutes before my alarm was to sound. I ate, drank, showered, and walked Xander. I arrived at bandwidth.com close to 6, got my chip, and started to stretch. My calf muscles were very tight from yesterday’s race, so I decided to wear the Zensah compression sleeves before, during, and after the race. One of the first people I talked with was Troy, a former co-worker. He was running the 10k, and I provided him my first aide kit so he could pop a blister on his foot. Nasty. As we were talking, my good friend, Ronnie, came by. He also ran the half, so we talked and ran a warm-up mile or so together. I saw another good friend, Gregg, at the start. He was also running the half. The race began promptly at 7, and we were off. We immediately crossed Weston Parkway and ran on Reedy Creek toward Lake Crabtree. A young man took off, and I began the trash talking with Ronnie and Gregg. Ronnie had run a “hard 13” miles yesterday, and let me know that he was not in it to win it. He didn’t stay with the front runners for very long. We approached a downhill, and I said, “What’s this gentlemen? A downhill? I like downhills!” And I was off. I dropped the young man. Gregg stayed on my heels. I led until the end. It lightly rained on an off, and there was a downpour just after I finished. It was nonetheless hot and muggy, and I was almost immediately drenched in sweat. My legs were tired, and got progressively more and more tired. My splits were all over the place, with some miles as fast as 5:50 and some as slow as 7:20. The race stayed on Reedy Creek until Trenton Rd. Thus, there were steep inclines and declines, i.e., uphills and downhills. Awesome. I carried 2 Gus, and took one at mile 3. I couldn’t get the damn zipper on the back pocket of my shorts closed, and the other Gu evidently fell out somewhere along the course. I could’ve used it, but I survived without it. We ran a very small loop at the turnaround. Francisco and a man who eventually came in 4th (3rd male) were not too far behind, maybe 200 meters or so. I thought, “I can run easy and race the last miles or I can put some distance between me and them and just hold on.” I eventually settled on a combination of the 2. I did let loose on the downhills, but I also worked the uphills. I took most tangents (when I wouldn’t get in the way of other runners), and I surged as I crested every uphill. Most runners were very encouraging. I was amused when one yelled (yes, yelled), “Pick it up!” Huh? 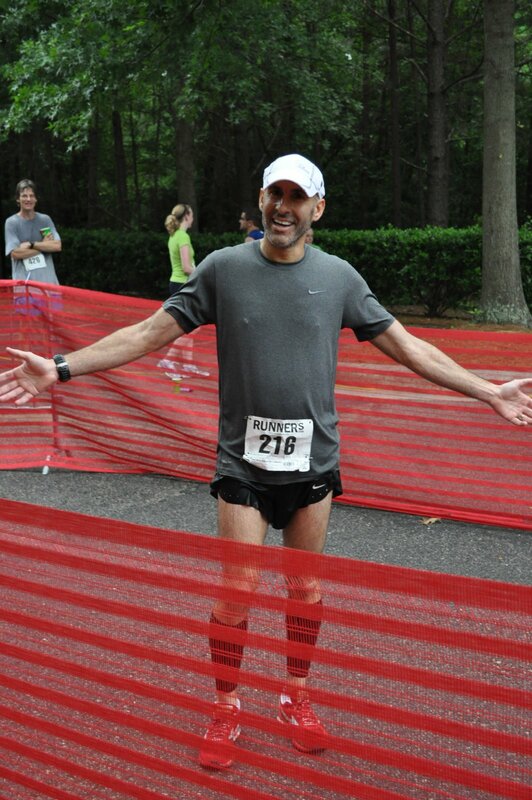 The race took a turn at Lake Crabtree, and we ran on pavement (ouch) for the remainder of the course. 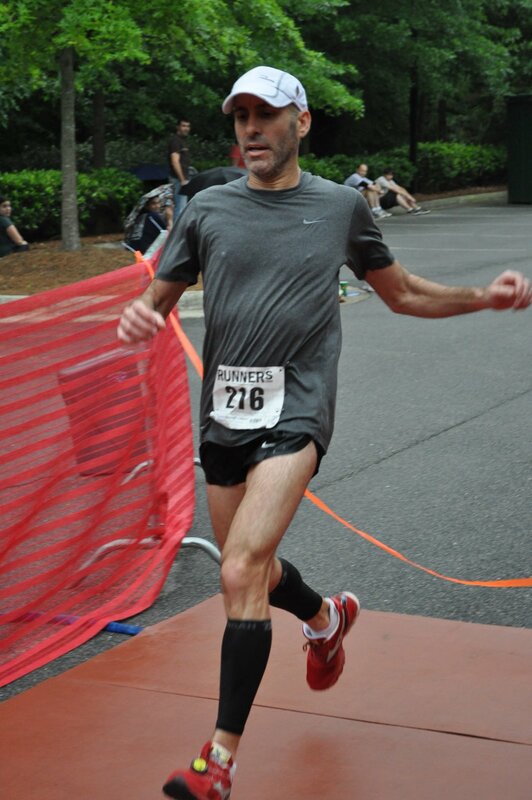 The 10k racers were also on this part of the course, so I had to do much maneuvering to get around the slower runners. I occasionally looked behind me to see if any of the half marathoners were approaching, but never saw anyone. I eased up a bit. There was one last turnaround before the remaining .6 miles. I hadn’t studied the course, and was a bit confused, but the volunteer, Rob, let me know I was almost done. He said, “You’ve won the half! Great race!” My GPS was about .5 under. My splits were faster than I thought. I sprinted the downhill to the finish, stopped my watch, had my chip removed, my picture taken by Ben Dillon, and then went to my car for water. I was parched. I changed shirts, and ran 2 cool-down miles. I won at $50 gift certificate at Inside-out Sports, and a 30-minute massage with Lal at Athletic Edge. I already have a 90-minute massage schedule with Lal tomorrow night. I need it!